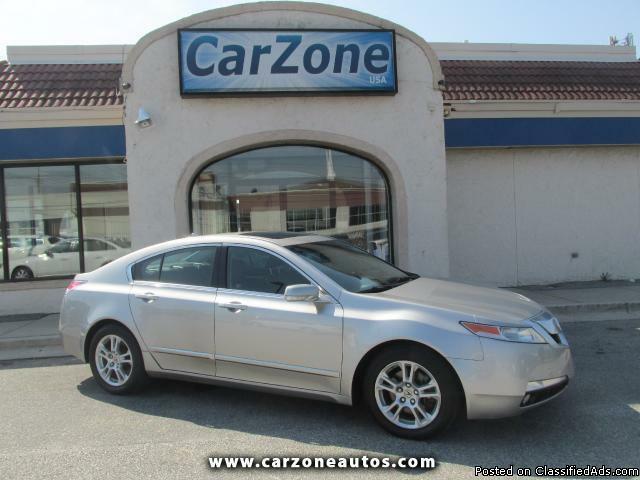 xxxx ACURA TL | Palladium Metallic (Silver) with Black Leather Interior | Named a finalist for Motor Trend xxxx Car of the Year, the Acura TL was named on Edmund's lowest cost to own list for xxxx and named a Consumer Guide 'Recommended Buy' for xxxx. Motor Trend reports ''that even the base model comes fully loaded,'' and says the ''TL is still a solid player.'' Road & Track reports that it ''is a genuine sports sedan that offers a lot more spice & excitement than its larger, more luxurious big brother,'' and says ''if you want to know what Acura is all about, drive the TL.'' The NHTSA gave it perfect 5-Star safety ratings and J.D. Power gave it 5 out of 5 power circles in overall quality. U.S. News gave it a 10 out of 10 safety score and said it offers a ''compelling blend of comfort, sportiness, luxury and technology.'' With a spacious, high quality cabin, the TL offers features such as turn signal mirrors, leather heated seats, sunroof, Homelink, Bluetooth, a carbon fiber and woodgrain trim, dual automatic climate controls, 6-Disc CD player, auxiliary and USB input, and satellite radio. Offering almost 300 horsepower, the TL is a fun to drive, stylish car that you'll never want to upgrade from!